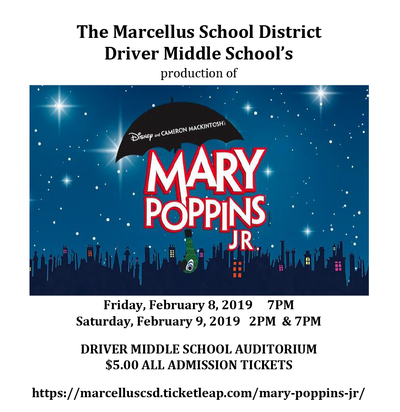 Feb. 6, 2019 -- Don't forget: Driver Middle School presents this year's musical, "Mary Poppins Jr.," at 7 p.m. Friday, Feb. 8, and 2 p.m. and 7 p.m. Saturday, Feb. 9, in the DMS Auditorium. The musical is based on the stories of P.L. Travers and the Walt Disney film starring Julie Andrews.